Something I have been thinking about for sometime now, is a homebuilt Tiltrotor. It gives me something to consider in mental slow times. 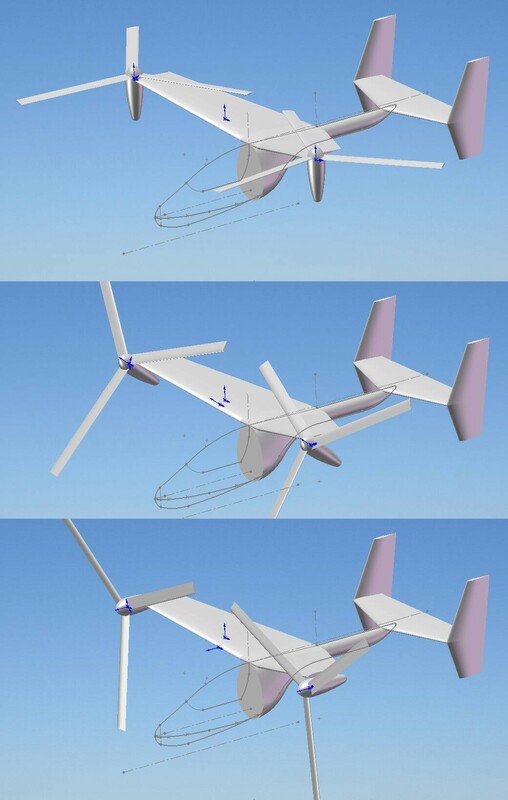 The success of the Mosquito UL helicopter and the Helicycle, my engineering background, and design and mechanical expertise are leading me in the development of this project which is obviously only in the imagination phase. As it is envisioned now, a target empty weight of about 600 pounds (275kg), >200mph cruise, autorotative capability, single pilot, twin turbine engines (~100hp each), stowing rotors/wing, 500 mile range, cross-engine linking to provide single engine ops. See the solidworks conceptual sketch below. Below that, is a photo of a Tiltrotor in cruise flight with the nacelles 'converted' forward. Don't look for this at an airport near you any time soon..
Commercial tiltrotor under development during test-flight below.